The online version of this article ( https://doi.org/10.1186/s12859-019-2756-y) contains supplementary material, which is available to authorized users. First introduced in 1934, chloroquine was a front-line antimalarial until the late 1950s when its heavy usage led to emergence of resistant P. falciparum strains near the Cambodia-Thailand border . Chloroquine resistance has now been confirmed in over 40 countries, making resistance to this drug a global concern . The mechanism of action of chloroquine is well studied. In intraerythrocytic trophozoite parasites, the drug blocks detoxification of heme, a byproduct of hemoglobin degradation . During the asexual intraerythrocytic-stages, the parasite imports host cell hemoglobin into its food vacuole [7, 8]. Proteases in the food vacuole degrade hemoglobin into free amino acids which are utilized in various growth processes . Heme is released during hemoglobin digestion and is essential for parasite growth as a cofactor for cytochromes in the parasite’s electron transport chain [10, 11]; however, elevated levels of intracellular heme can lead to cellular damage: oxidation of proteins, inhibition of proteases, and damage or lysis of membranes [12, 13, 14]. Heme released from hemoglobin is detoxified through three known mechanisms:  polymerization into hemozoin crystals,  detoxification through interactions with hydrogen peroxide in the food vacuole, and  a glutathione-mediated degradation process in the cytoplasm [7, 13, 15, 16]. Chloroquine chemically binds to heme and the growing ends of hemozoin crystals, preventing crystallization-mediated heme detoxification [17, 18]. Chloroquine-resistant parasites are able to export chloroquine , which reduces the accessibility of chloroquine to its heme and hemozoin targets [20, 21]. This resistance phenotype is mediated by mutations in the P. falciparum chloroquine resistance transporter (pfcrt) gene that results in the removal of drug from its functional site, the food vacuole [22, 23]. Numerous mutations are associated with chloroquine resistance, depending on the genetic background, and result in varying degrees of resistance [22, 24, 25, 26]. However, the substitution of lysine to threonine at position 76 in pfcrt is found in all in vitro chloroquine-resistant parasites [27, 28]. Six enzymes are known to utilize thiamine diphosphate (also called thiamine pyrophosphate) as a cofactor in P. falciparum [46, 47, 48, 49, 50]. 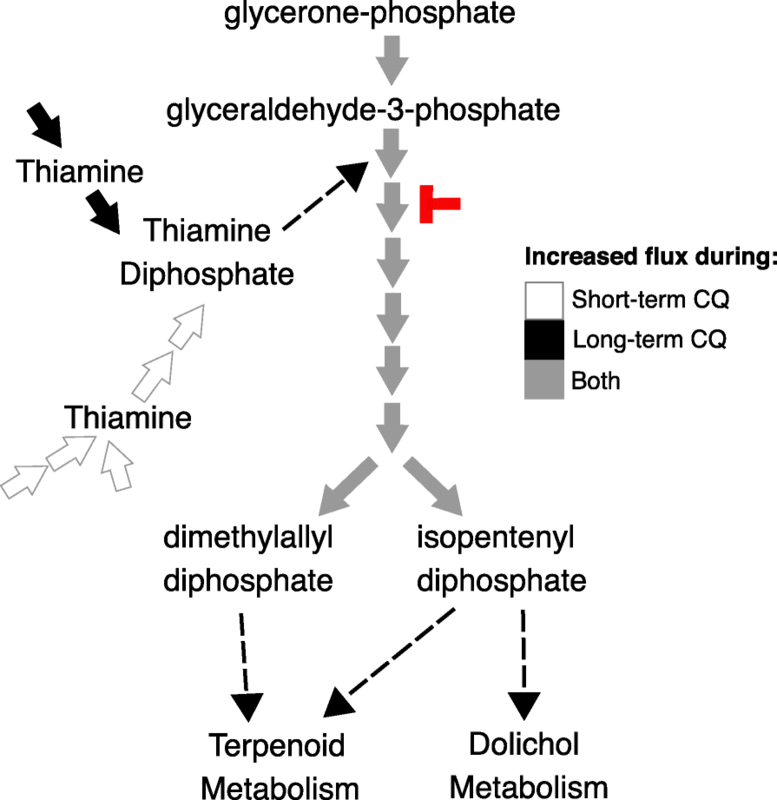 Flux levels of these reactions predicted from flux balance analysis were investigated to understand thiamine diphosphate usage and essentiality. Flux balance analysis simulates steady-state flux values through the network’s reactions and predicts the reactions needed to maximize the objective function, which was selected as the biomass equation; thus, this analysis predicts reactions needed for growth. Four of these thiamine diphosphate dependent enzymes (pyruvate dehydrogenase, 2-oxoglutarate dehydrogenase, 3-methyl-2-oxobutanoate dehydrogenase, and branched-chain-alpha-keto-acid dehydrogenase) are predicted to carry no flux in treated and untreated parasites. In response to drug treatment, flux changes through two thiamine diphosphate-dependent reactions: flux through the reaction catalyzed by 1-deoxy-D-xylulose phosphate synthase increases (in isoprenoids metabolism) and flux through the reaction catalyzed by transketolase decreases (in pentose phosphate pathway). Flux of the other reactions in isoprenoids metabolism are also consistently greater in response to chloroquine treatment (Fig. 4 in grey; Additional file 1: Table S8). Compared to untreated models, short- and long-term treatment show a 62–83 and 24% increase in flux, respectively. The transport of glutathione from the extracellular environment into the cytoplasm is predicted to be essential during chloroquine treatment (Fig. 3b). Glutathione is involved in the degradation of non-polymerized heme, in addition to being involved in managing oxidative stress in the parasite . Since these reactions are only essential during chloroquine treatment, this result suggests the activation of these reactions may be a direct result of drug pressure placed on the parasite and the accompanying cellular damage. 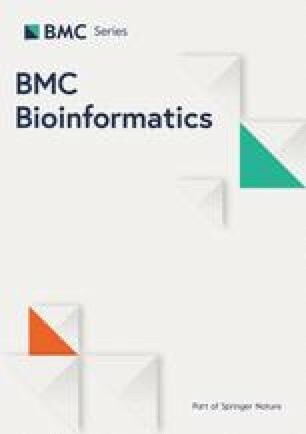 This result is supported by observed correlations between chloroquine resistance and intracellular glutathione levels [56, 57, 58]. The competitive inhibition of glutathione degradation by heme also supports the increased importance of glutathione accumulations to counteract chloroquine pressures . Thus, glutathione is essential in combating the effects of chloroquine and can be considered another metabolic weakness of resistant parasites. Folate metabolism is needed for DNA synthesis and metabolism of certain amino acids . 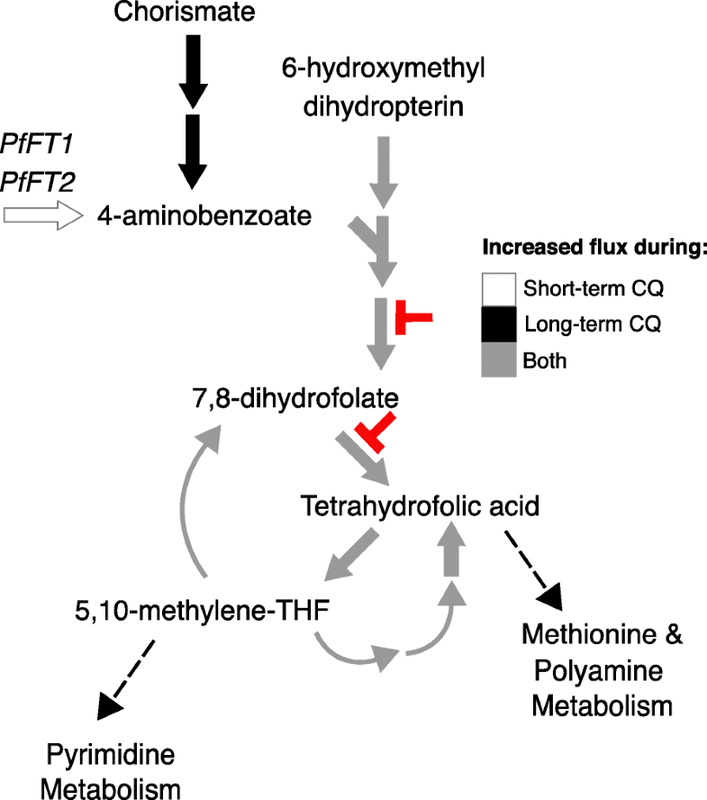 Interestingly, downstream steps in folate metabolism, including dihydropteroate synthase and dihydrofolate reductase, are predicted to carry more flux during chloroquine treatment (Fig. 5), implying they are necessary for survival or tend to be overexpressed during treatment. This result suggests that this pathway has increased importance under chloroquine treatment and could be targeted in combination therapies. Recent clinical use of such a combination therapy supports this conclusion; chloroquine in combination with inhibitors of dihydrofolate reductase and dihydropteroate synthase (sulfadoxine-pyrimethamine) is effective against chloroquine-resistant parasites [60, 61, 62]. 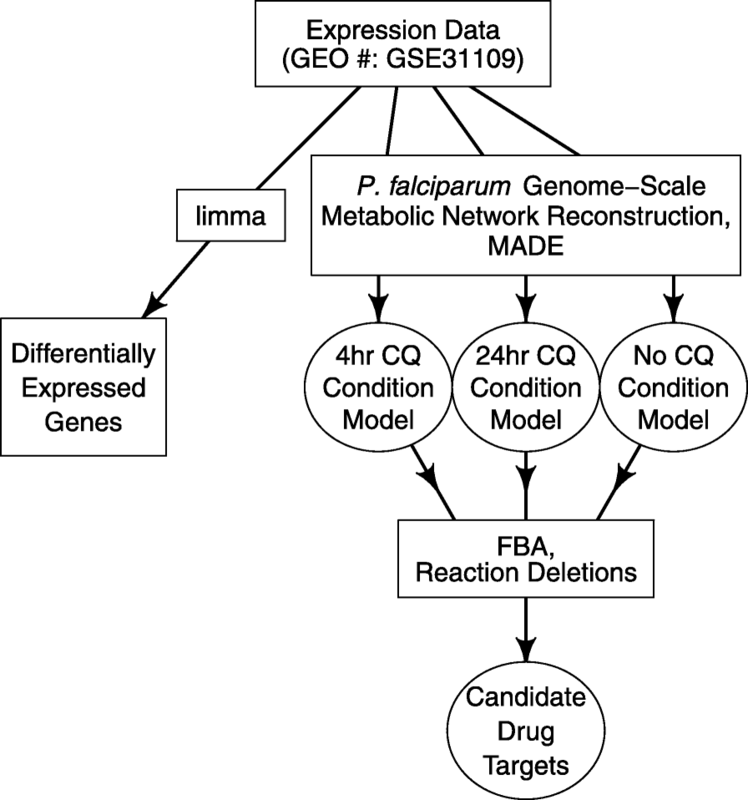 Our results suggest that chloroquine-resistant parasites are more susceptible to these drugs than sensitive parasites and our modeling approach provides a mechanistic explanation for this drug synergy.